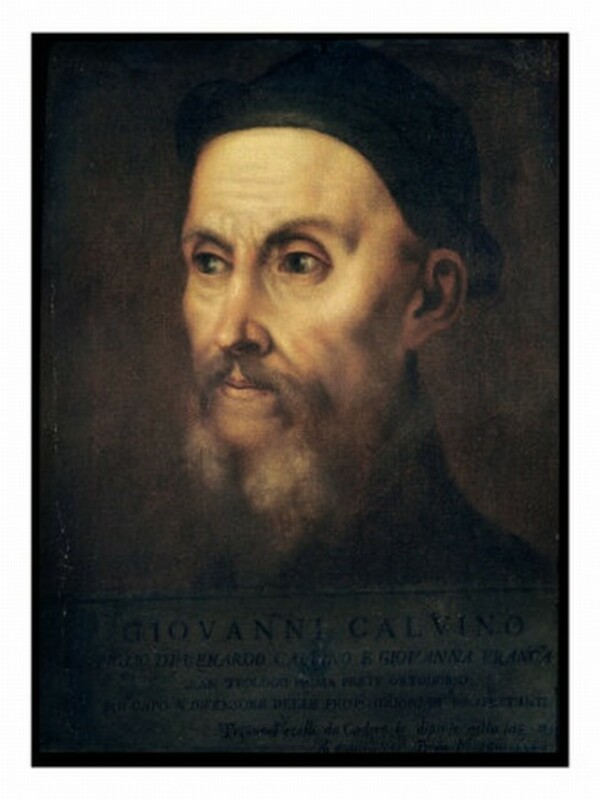 Jean Calvin (1509-1564) was a lawyer and a scholar from Paris who— in Geneva, Switzerland—founded the most influential branch of Protestantism. He was more radical than Martin Luther. Calvin taught and preached in Geneva for 30 years. Despite ill health, he preached five sermons a week. He also founded a college that soon made Geneva a great center of learning. Capitalism owes its birth and success to the moral teachings of the Reformers, especially John Calvin. The Protestant work ethic—to be sober, honest, earnest, and hardworking—created the modern entrepreneur. Catholics, by comparison, were rather easygoing. Calvin taught his followers to live modestly so that they would have plenty of assets left over to give to charity. Calvin led by example, as he lived modestly, never owned a home, had few possessions, and refused repeated offers to increase his salary. Jean Calvin was a thoughtful, quiet, Catholic youth in Paris. He possessed a powerful and penetrating mind; and exhibited intellectual ardor and religious devotion. His cousin, Olivetan, had joined the Reformers, but Calvin refused at first, saying, "I will have none of your new doctrines. Think you that I have lived in error all of my days?" Olivetan replied, "There are but two religions in the world. The one class of religions are those which men have invented, in all of which man saves himself by ceremonies and good works; the other is that one religion which is revealed in the Bible, and which teaches man to look for salvation solely from the free grace of God." Calvin could not stop thinking about these words. 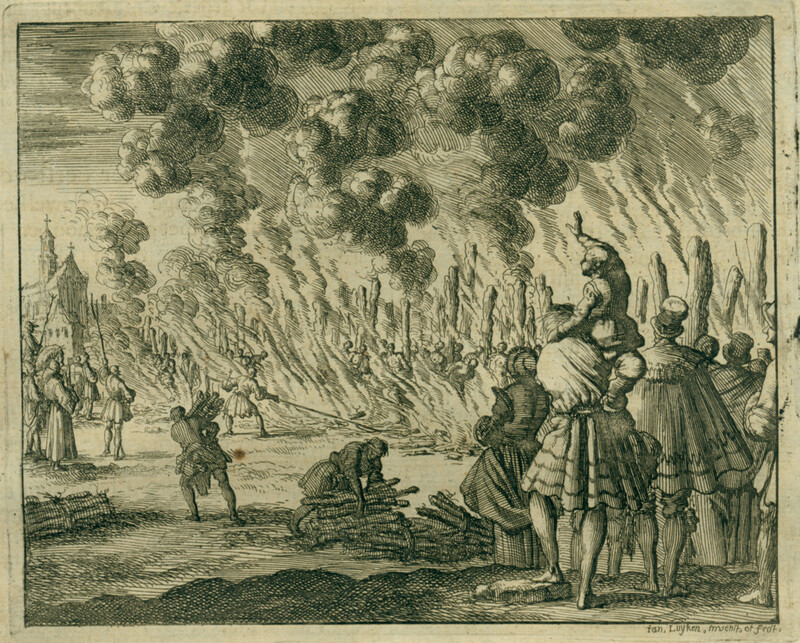 One day he happened upon a burning of a Protestant in a public square. He was moved by the look of joy on the martyr's face as the flames climbed higher, engulfing the man who looked happy to be there. He began to study the Bible and he found Christ. 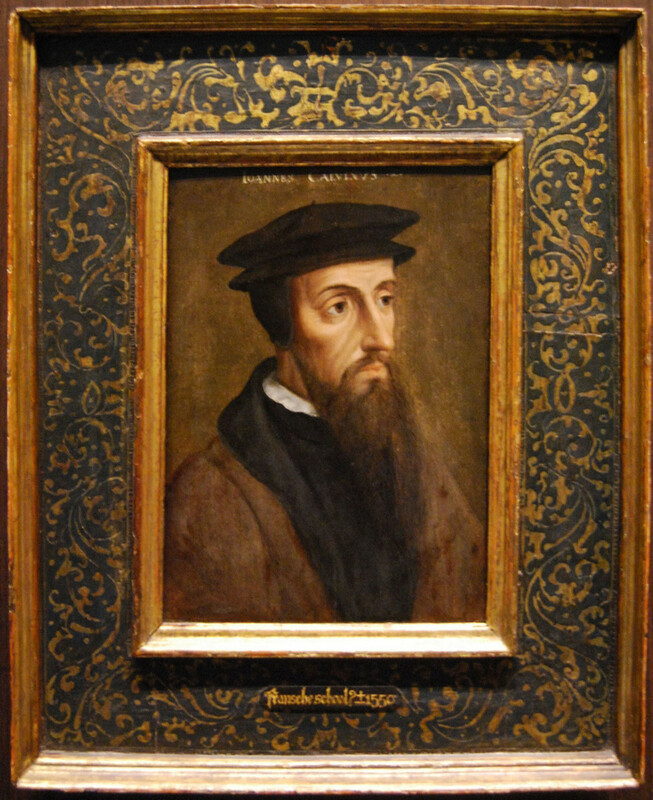 Calvin then broke from the Catholic Church and joined the Protestant Reformers. 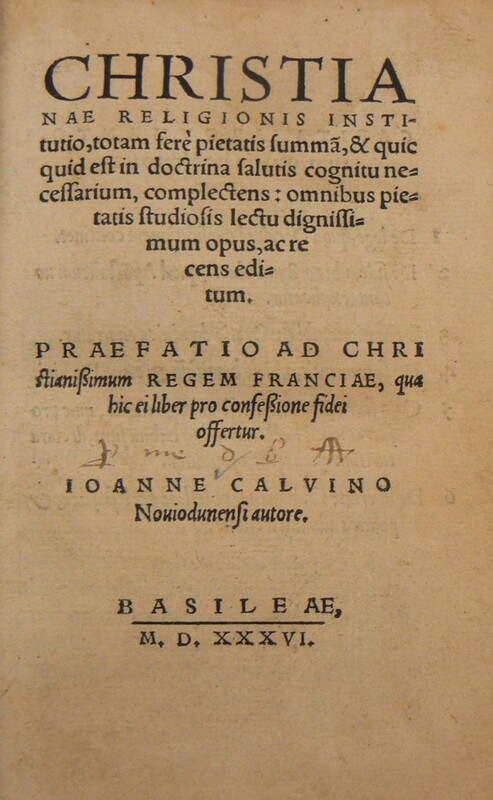 At the behest of the Catholic Church, Francis I issued an order for Calvin's arrest. Calvin narrowly escaped out a window while the cops were at the front door seeking to apprehend him. He then traveled to Poitiers wearing a disguise. There he held secret meetings in a cave where he read the Bible aloud and answered questions about its meanings. 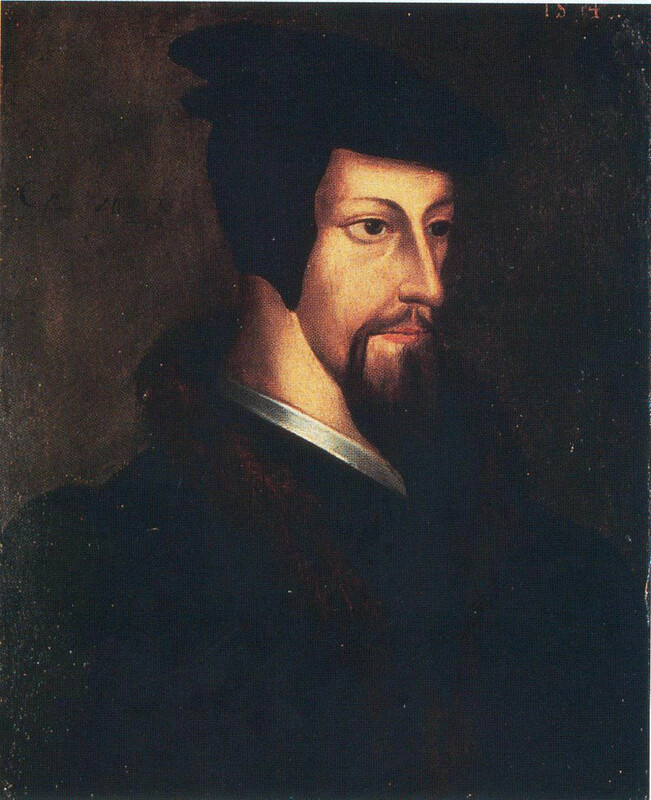 John Calvin believed that Martin Luther's ideas were loosely arranged in a piecemeal fashion, and he sought to put them in order. Calvin was pure, strict, and systematic. 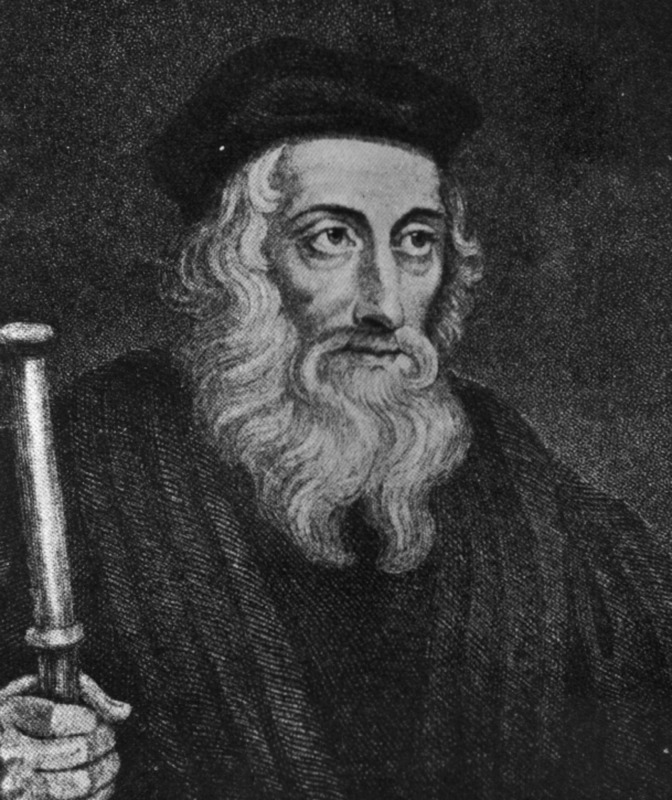 To discourage crackpots, he wrote the textbook for Protestants, entitled Institutes. Calvin was an original thinker, especially on matters of private morality. No detail was too trivial to escape his attention. Calvin loved astronomy but condemned astrology. A good Calvinist family was to avoid frivolous pleasures such as drinking, singing, dancing, gambling, and flirting. Calvin was opposed to bringing attention to oneself by wearing flashy clothes, talking loudly, or gesturing wildly. He preached the joy found in reading the Bible every day for guidance; and in living a life marked by hard work, thrift, self reliance, sobriety, and godliness. He taught that when a brother or sister doesn't come to church—or far worse commits adultery or blasphemy—an elder in the church should visit the straying one and gently admonish him and plead with him—not to scold. Blasphemy means to cast aspersions on God. Calvin wrote, "If the Gospel was the rule of life it must also be true that living right was totally dependent on the will of God. Only then is the life of a Christian a composed one when it has the will of God as its aim. 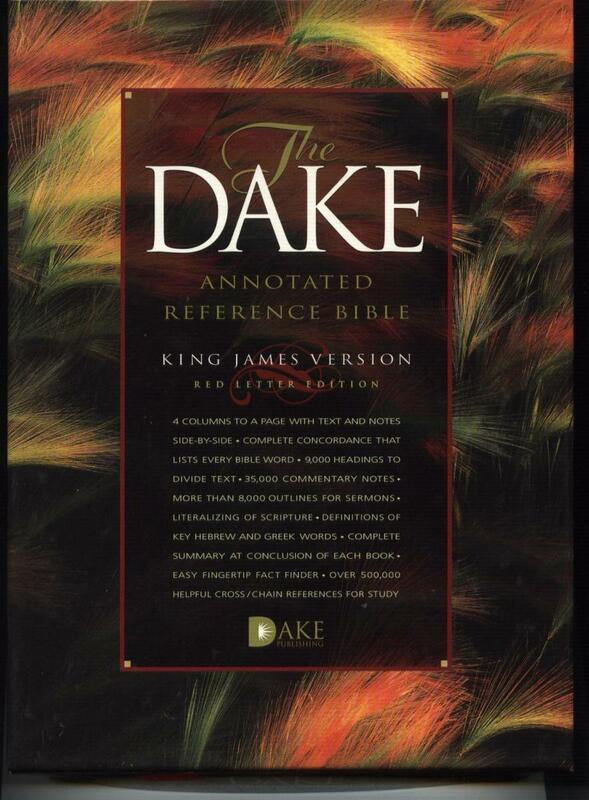 All doctrine must be derived from the Divine Scriptures, without anything being added or subtracted." True faith did not base itself on anything human, not even on the church and its traditions, but only on the clear Word of God. 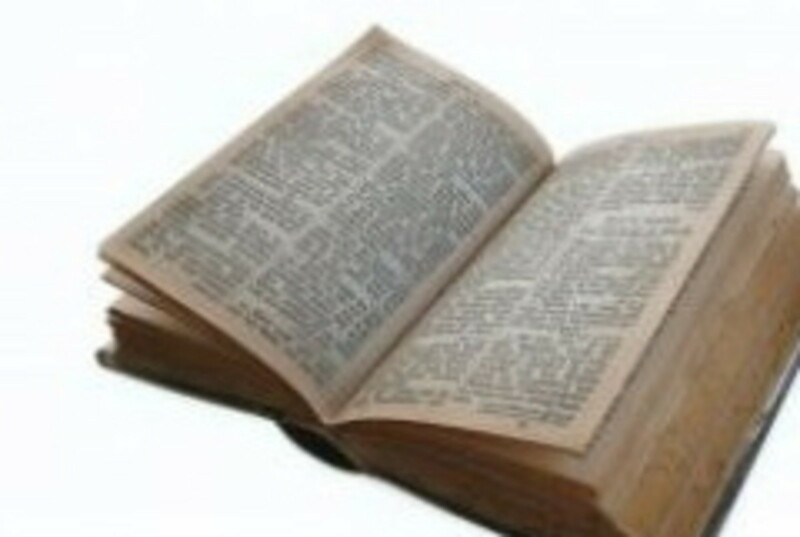 The fathers of the church had citied the authority of Scripture and did not want their own writings to be equated. Calvin was now a fugitive from his native France, and fled to Geneva. The church there persuaded him to take control of it. He refused twice, as he did not want power. He was timid and sickly. He felt he could make his greatest mark in quiet study alone with his pen. Besides, how could the little city of Geneva resist the power of the Catholic nations of Europe? 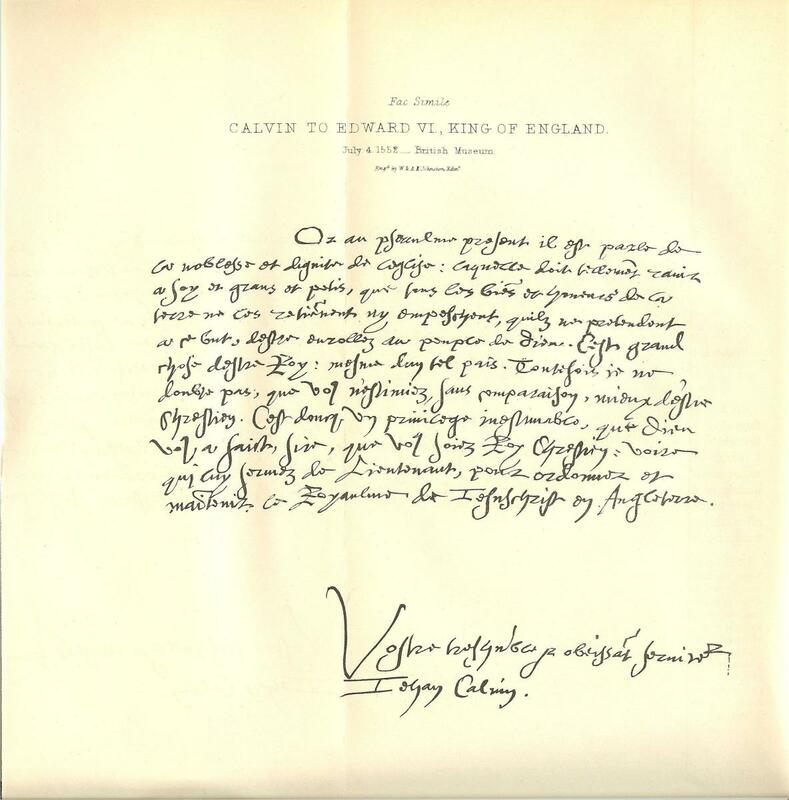 Calvin was booted out of Geneva in 1538, but two years later he was begged to return, which he did. 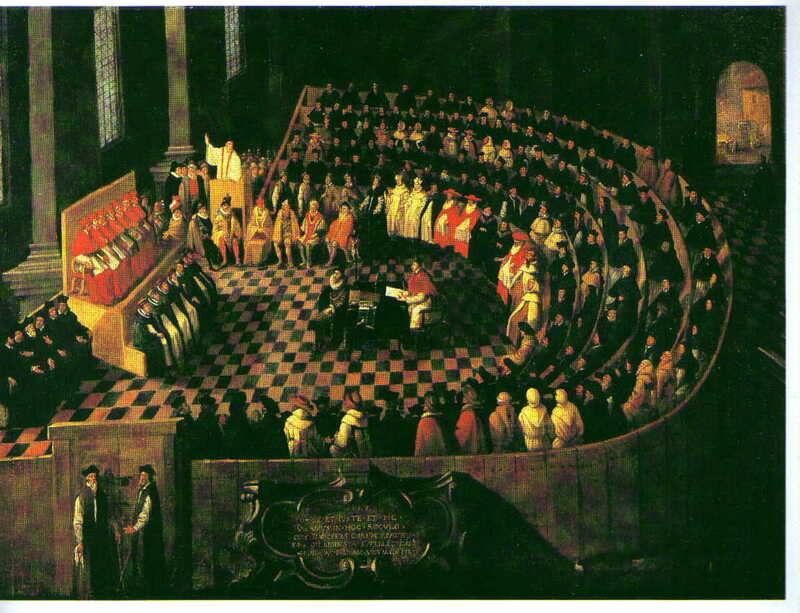 Calvin reorganized the church. His church would have no bishops or archbishops. Pastors would care for the congregation; elders were in charge of discipline; deacons handled charity; and teachers taught. Services were simplified. Geneva closed its alehouses, theaters, and dance halls. Calvin instituted a monthly communion (rather than yearly). John Calvin's doctrine of predestination, in which he saw humanity divided into the Elect and the Damned, shocked Europe. Christ has not reconciled the world, but only the Elect, Calvin taught. The Elect would be obvious by their appearance, conduct, church attendance; but also by their worldly success, since God would bless them with prosperity. Calvin also insisted on strict separation of church and state, a revolutionary idea at the time. His followers in England became known as Puritans and in Scotland as Presbyterians. Calvin said, "We should not pry into what God has left hidden in secret, nor should we keep silent about what he has brought into the open. We should pay attention to the Word of God with awe and wonder." He wrote that our paths are set for us by the will of God and that free will is but an illusion. 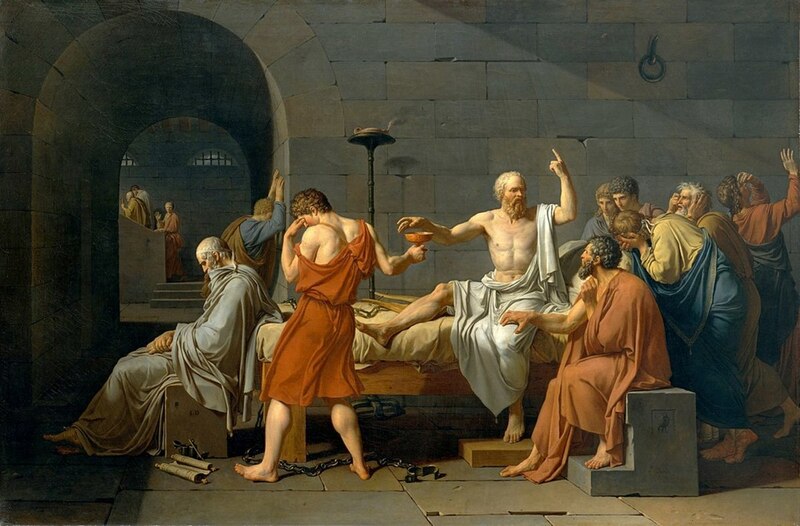 Modern Social Liberals espouse the same thing—though they substitute genes and fate for the will of God—when they say nothing happens by accident, people are born gay, addicts can't help themselves, criminals are born that way or become the way they are by the fault of society not by their own moral failings (free will). To the Godless, all defective people need therapy or rehabilitation from an expert. To the Godly, they need Grace. Calvin wrote, "If one person is struck down by the fall of a house or a tree, if another wandering through the desert paths is kept safe, the unspiritual will attribute these things to luck. But those who have learned from the mouth of Christ that every hair on their head is numbered will believe that every single event is governed by the secret direction of God." He explicitly taught double predestination, which means that before people are born it has already been decided by God whether they are going to heaven or to hell, and that it is set in stone—there is nothing the Damned or the Elect can do to change God's mind about their fate. Many theologians from Augustine to Luther had believed that some people are predestined to go to heaven. Calvin simply pointed out the obvious: if that is true, then those not predestined to go to heaven must be predestined to go to hell. Luther had said we should simply not discuss this aspect of predestination doctrine because it would cause despair in some and presumption in others. Calvin said that the ultimate destiny of all people has been decided by God. This makes it God's will that billions of people are born Damned. The absence of Election must mean Damnation, meaning that God wills to exclude some from the inheritance he predestines for his own children. Any other view was a compromise and dilution of Scripture. If our behavior did not factor in to our salvation, then neither was it a component of damnation. God has simply chosen some and condemned others. Some people are therefore sentenced to eternal damnation before they are born, before they have even had a chance to sin. A close read of the Bible does make it appear that God selects his people, rather than vice versa. God surely selected Abraham, Noah, and David. 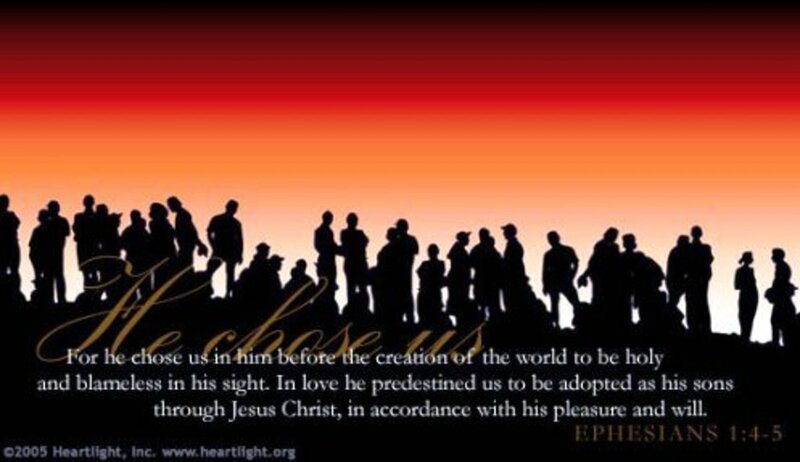 Jesus selected His disciples. God elected the Apostle Paul. Many previous theologians had explained this away with the concept of foreknowledge, meaning that though people have free will, God already knows what they will do, because He exists outside of time. Double Predestination means that not only does God have foreknowledge but that everything that happens on Earth is His will. Calvin quoted Augustine, "The reason God did not save the damned was that He did not want to, and why He did not want to is His business." Jean Calvin— Yes, Jean Calvin did love Lord. And, as you say, he was strident and radical. I don't think any human person can get it all right; only pieces of the puzzle. Calvin is off here and there but he also filled in some important blanks. Thank you for that interesting information about Oxford. I visited that fair city once. It would be a treat to spend some time at one of the colleges in any capacity. Thank you for your ongoing encouragement. I hold you in the highest esteem because when I look at you I see Jesus. James A. Watkins, Wonderful concise lecture as always Professor! I somehow let this one slip by but what a treat! John Calvin no doubt was an intelligent man although quite stringent and a bit radical... Your discourse on his life is quite thorough and most edifying. He was indeed a man of integrity who loved the Lord. It is always sheer delight to examine your well researched and interpreted works. The University of Oxford is broadening their outreach. I recently read that they have; “a unique collaborative research effort to find solutions to the challenges facing humankind in the 21st century…” What is so interesting it is called the James Martin 21st Century School. So don’t give up your dream! Hmm… Once you have completed your brilliant project of observations perhaps they will be interested? Just maybe they will consider you as a guest lecturer…. There is no doubt that you have a natural God given gift with the mighty pen! As the Word says “Your gift will make room for you.” Thank you for sharing, In His Love, Peace & Blessings! stars439— I always appreciate it when you come by and offer your encouraging words. Thank you for being a friend. God Bless You! "I believe God prompts, I believe he even moves you, but he wants you to accept him. God does know what will happen, but does not mean it is "His Will" for it to be happen." "The arguments serve no purpose, but to sew confusion to the non-believer." I hope this article does not sow the seeds of confusion. This is part of a history of Christianity I have been writing in now 29 episodes. I am writing it because it is a subject I love to research and write about. I am attempting to show the story of how we got from 33AD to 2010 with regard to the Faith. The schisms and then splits into denominations is an important part of that story. Dear James : Interesting read. Now I will know what people are talking about when I hear the term Calvinism, and where Capitalism comes from. Great work and Wonderfull Photographs. GBY my brother. Calvinism, Arminianism, let's drop the ism's. It is Christianity. The arguments serve no purpose, but to sew confusion to the non-believer. It is by grace alone. I believe God prompts, I believe he even moves you, but he wants you to accept him. God does know what will happen, but does not mean it is "His Will" for it to be happen. A simple illustration is a baby reaching for something hot. The baby can not understand hot, until he/she feels the sensation. You told him/her no, you may even have stepped in and stopped the baby. But he continues to not bend to your command. You know she will be burned, but she needs to face the consequences of disobedience. I did not want him to be burned, but I needed to allow it to happen. I believe when we get to heaven we will be surprised by what we missed in both directions. cristina327— Thank you very much for your kind words. I enjoyed reading your comments. You are surely welcome. Best Regards to you. What a great hub it is and what an inspiring testimony of courage, devotion to God and dedication to christian calling. Truly I am inspired by Calvin's testimony of faith and profession of christianity. I am a firm believer in the doctrine of "Election" or the doctrine of "Sovereign Grace." Thank you for sharing it here at Hubpages. Remain blessed always. Best regards. Nice job and an interesting read, made me revisit my youth, raised in the heart of Calvin country - the headquarters of the Chr. Reformed Church, including Calvinettes. CJ Williams— You are welcome and thank you for your compliments. Welcome to HubPages! 50 Caliber— Thank you, my brother. I love your comments, and I appreciate this visit from you. Tom Whitworth— Thank you, my dear friend, for gifting me with this praise. I surely appreciate you. blue parrot— I make a concerted effort to keep my Hubs as short as posible—but rarely succeed. My book is about my observations of America and the world during my lifetime—1955 to present. What has changed, why and how did it change, what have been the results of change. Right Black— I'm glad you enjoyed the Hub and the comments. Your remarks are quite sensible. I have many good friends who are Calvinists; and Calvin can surely quote Scripture to back up his deep analysis. But, like you, I can't buy into it. Therefore, I have made a conscious decision to be an Arminian. And I'll be writing a bit about Arminius soon. Thanks for coming by to visit. James, Excellent hub, to force even the brightest of minds filled with abilities to quote scripture and verse, as well as a rounded understanding to stop and think. Then there are those like me, kind of slow in that arena, forced to learn and I enjoyed the ensuing comments as well! I am catching up on my reading. You really hit the nail on the headwith your exposition on Calvin!!!!!!!!!!! I have been to many, many protestent churchs in my time but in only one did I hear the people describe themselves as Stiff Neck Presbyterians!!!!!!!!!!!!!!!!!!!!!! James A Watkins, I enjoyed reading your hub. I also enjoyed the comments. The biggest problem I always had with Calvinism is that it makes God the author and creator of evil. If God creates men who are his elect and those who are damned then the sins of the damned are predestined by God. Therefore, he is responsible. This in turn makes God the vehicle of sin, not the choice of Adam and Eve. God is thus made to be evil and we serve an evil God. Of course we don't serve and evil God, hence, Calvin's predestination doctrine is fallacious. Good Hub. "The major thing being left out in the modern churches is repentance for sin." "Most liberal churches today will not teach or preach about sin or repentance because it might offend someone or make them feel bad. What an absolute mess when men will not stand up for God and his Holy Word." "Sin is destroying this great nation of ours, sin is destroying the souls of men." This was a very informative hub, well written. 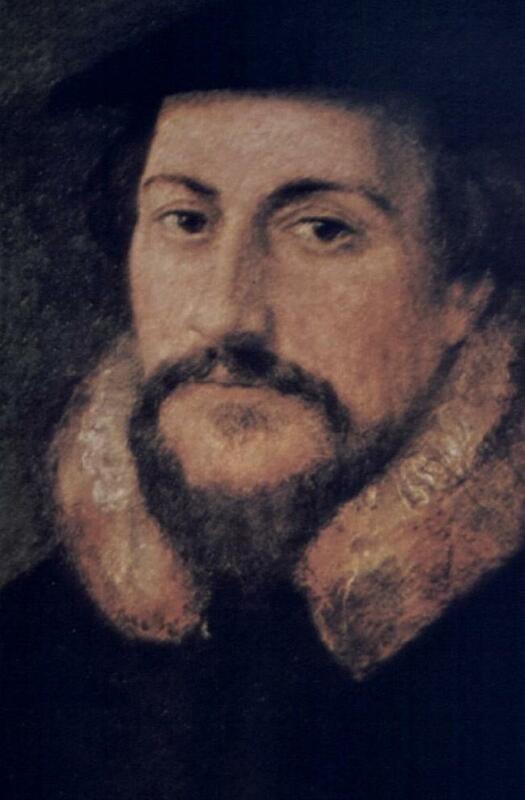 I have often been accussed of being a calvinist but never really knew who he was. I have found that God has directed my lifes path placing before me through true men of God, the seed of his word. And those men plowwed my heart to make the good ground to recieve his word, as my knowledge of God increased I found belief alone would not save me. I can't count the number of empty prayers I had been lead in by well meaning people that left me more confussed because I did not have peace. neither will works save you,it is not of ourselves, but we are his workmanship. These are the things God works in us. The major thing being left out in the modern churches is repentance for sin. How important is this to God? You can not be saved apart from the presence of God that works repentance in us the we can believe. 2 Corinthians 7:10 For godly sorrow worketh repentance to salvation not to be repented of: but the sorrow of the world worketh death. Most liberal churches today will not teach or preach about sin or repentance because it might offend someone or make them feel bad. what an absolute mess when men will not stand up for God and his Holy Word. especially when the difference between Godly sorrow and worldly sorrow is "Life and Death"! 2 Corinthians 7:10 For godly sorrow worketh repentance to salvation not to be repented of: but the sorrow of the world worketh death. Matthew 9:13 But go ye and learn what that meaneth, I will have mercy, and not sacrifice: for I am not come to call the righteous, but sinners to repentance.Luke 15:7 I say unto you, that likewise joy shall be in heaven over one sinner that repenteth, more than over ninety and nine just persons, which need no repentance. Acts 5:31 Him hath God exalted with his right hand to be a Prince and a Saviour, for to give repentance to Israel, and forgiveness of sins. Sin is destroying this great nation of ours, sin is destroying the souls of men. The sad thing about people passing out tracts with the "Magic Prayer" on it is that people trust in that prayer and not God to save them. I know I was one of them. 2 Peter 3:9 The Lord is not slack concerning his promise, as some men count slackness; but is longsuffering to us-ward, not willing that any should perish, but that all should come to repentance. Who was preaching? Jesus! I am a Christian not a calvinist. I find my best to follow God since He miraculously saved me August 25, 2004. Allan McGregor— Yes, my discerning and learned brother. I do not buy into Calvinism myself. But I find his writings to be quite interesting. He made his case well. I know many Calvinists today, the "Frozen Chosen." Thank you for reading my humble Hub and sharing your wisdom with me and my readers. I always look forward to your commentaries. I was brought up in the Church of Scotland, while my Uncle Murdo once served as a member of the General Assembly of the Free Church of Scotland, so I am quite conversant with Calvinism. Like my uncle, Calvin himself was a modest and Godly man, but Calvin was also dead wrong on the matter of predestination, and even admitted as much in his later life when he conceded to an attenuated version of the Arminian view that it is possible to lose one's salvation. The extreme view expounded here is closer to what is known as Ultra Calvinsim - in other words, more Calvin than Calvin. However, far from being Biblical, Calvin's contentious misinterpretation of a legitimate Bible doctrine is actually an unbiblical form of fatalism much closer to the Islamic concept of Inshallah (God wills it). I've touched on it before, but the Ultra Calvinist paradigm of irresistable grace leaves evangelism dead in the water. Why obey Jesus' command to preach the Gospel, if the fate of those who would hear it is already sealed? They're either going to be saved anyway, or damned irrespective of what we say or they do. So if God does not will that men go to hell, we must make that decision. BDazzler— Calvin was quite a remarkable man. His influence is underrated and reputation a bit harsh. Thank you for coming to visit. And you are welcome. It's funny what you find out you don't know without realizing it. I have known about "Calvinism" forever it seems. As I read this hub, I discovered that I knew very little about Calvin himself. For example, I guess because all the Calvinists I know are Presbyterian with a Scottish background, I assumed he was Scottish. Dude was French! Go figure. H P Roychoudhury— Yes. This is the important message. Thank you for getting to the heart of it. It is great to know of Calvin. It was not scolding but counseling to raise the morality to win over the detractors. James, This was a very interesting hub. I didn't know most of those things about Calvin and it made for an interesting hub. christopheranton— You quite welcome. Calvin does get more than his share of bad press. I appreciate your visit and kind comments. Thanks for a most enlightening hub. Calvin was one of the more controversial of the reformers, and usually gets a bad press, but you painted him in a more human sympathetic manner. I almost found myself starting to like him. lovemychris— I think it has been a shame that textbooks have omitted any reference to John Calvin for the last thirty years. He is a major figure in history and has been incredibly influential. I don't see why there isn't plenty of room for both of them in textbooks. Thank you for bringing this to my attention. I hadn't heard about it until now. ArchDynamics— Hello, my friend! I couldn't stay away too long. The truth is I had five Hubs written but not published and I've decided to put them out this week and then take a month off from writing Hubs so I can get cranking on my book. You posit a heavy question, brother. hmmm . . . I suppose they both have a point. I think they both got where they are by their own volition myself. RevLady— You are welcome and thank you for reading my Hub. I appreciate your insightful remarks. I'm with you about giving attention to those condemned by the church. I can't bring myself to be a Calvinist, though I think he was a brilliant man. Judah's Daughter— You're welcome! It is great to hear from you again, my dear. I will surely go read both of your Hubs ASAP. Thanks for letting me know about them. This is the man who is going to replace Jefferson as far as philosophy in Texas school books...don't know how to feel about that. Whew ...you had me nervous for a minute, King James — I thought you might not be back Blogging quite so quickly! Speaking of Free Will ... I remember an interesting story from many years ago of two young Black men being interviewed about turning out so differently. Both told the story of growing up impoverished, no father, addicted mother, surrounded by crime. One was in law school, the other interviewed while in prison. The twist? During the interview, when the interlocutor asked about predetermination and the likely outcome of living under such horrible conditions, both brothers said about the same thing. Brother #1, in prison: "Of course I ended up here. Growing up like I did, how could it possibly have ended up any other way?" Brother #2, in Law School: "Of course I ended up here. Growing up like I did, how could it possibly have ended up any other way?" You're welcome. Thanks for the visit. Vladimir Uhri! Hello, my wise friend. David surely did dance for the Lord. Thank you for visiting my Hub. I appreciate your remarks. I've studied the pilgrims and their belief in predestination. Certainly the leaders could consider themselves destined for heaven, but what of the others? Why would someone who isn't succeeding in life remain with a religion that teaches he'll be going to hell? I think Calvin contributed significantly to our understanding of Scripture in general and certain doctrines in particular. I am inclined to give attention to those condemned by the church. gracenotes— How nice to hear from you again! You're welcome. As a singer, I cannot agree that singing is frivolous. And you are right, Luther was a fine singer and greatly encouraged everybody to sing. Flirting is fun. I truly believe there's an aswer to both Calvanism and Universalism, predestination of the elect and the damned, in the Bible. The Bible says God is no respecter of persons (Acts 10:34) and that He is the Savior of all men, especially those who believe (1 Tim 4:10); these and others are addressed in a couple of hubs I recently wrote. If you have time, I've written two (due to not wanting them to be too lengthy): "The Lamb's Book of Life" and "And the Books Were Opened". I would love your feedback, brother. Thank you and God bless you!! oh wait...dat was Calvin Klein. lightning john— Hello, my friend! You are welcome and thank you for dropping by. I see you've just published your first Hub! Congratulations! I'll be coming to read it in a few minutes. Welcome to HubPages. I do appreciate you for coming and for your lovely expressiveness. rprcarz50— You're welcome, Ron. Thank you for coming by to visit and leaving your warm words. Your Hubs are always rich in content and very informative! Thanks for sharing, Great Hub!! I personally do not believe predestination as brother Calvin did. People take man's doctrine and hang on that. Hey, you did it! So, thanks. Singing a frivolous pursuit? Oh my. This is surely in contrast to Calvin's contemporary, Martin Luther, who was so important to the development of church music. I have no doubt that Luther broke out in song several times a day on average. The worst one, though, is thinking that flirting is a frivolous pursuit! Please tell me it isn't so! Flirting is one of those activities that makes life worth living. My long-ago roots are in the Cumberland Presbyterian Church, which was founded in America on the frontier, and which really didn't agree with Calvin. Cumberland Presbyterians chose, then, as now, to be "fence-sitters" on the question of predestination. You can't be a pioneer in the West without thinking that you have a lot of control over your own destiny! Hello, hello,— Thank you very much for being my first visitor! I'm glad you were the first to come. You are quite welcome. John Calvin sounds like a real bore. I geuss if you're predoomed from birth you may as well try to enjoy your remaining days. Thanks for the history of him. As always, a wonderful, thought provoking and beautifully written hub. I posted it on FB, James. Thank you for writing this wonderful read . Good content! Wow, I am the first. How about that? Especially with you, James. There is usual a line as long as ever. Thank you for another more than well written hub. A very interesting read about a man with different ideas and outlook. Thank you.